Im trying to build for the simulator is that why I get "no matching cpu architecture as in screenshot ? 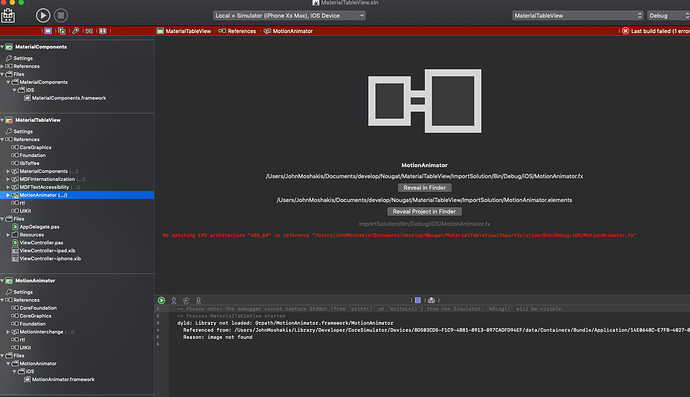 W: Could not resolve reference ‘MotionAnimator’ for target ‘Toffee-iOS’ (Simulator). Reference ‘MotionAnimator’ was resolved to ‘/Users/JohnMoshakis/Library/Application Support/RemObjects Software/EBuild/Obj/MotionAnimator-8CBF51F94B69439BE41587A7617CA3C6CB4ED7C7/Unknown/Toffee-iOS/Device/MotionAnimator.fx’ for target ‘Toffee-iOS’ (Device). E: Could not resolve reference ‘MotionAnimator’ for target ‘Toffee-iOS’ (Simulator). It seems like the only way I can get past that error is to do a full rebuild.